Canning Meat - Beef, Chicken, Turkey and other favorites! - Canning Homemade! Home » Chicken » Meat » Canning Meat - Beef, Chicken, Turkey and other favorites! Canning Meat - Beef, Chicken, Turkey and other favorites! Day two of my weekend of canning started out with Beef, specifically the canning recipe for Beef Stew. A traditional beef stew has a thick gravy but any cornstarch or thickeners are a "no no" in canning. In doing this recipe I develop flavors in the jar and when we are ready to eat it I will add my thickeners then. Please read this Note: The Stock/Broth recipes below talk about adding back the stripped meat or trimmings to the stock before processing. This is not a lot of meat since you are suppose to trim the bones or carcass before adding the initial water. My estimate is about a cup of trimmings for the whole batch. Also there isn't an exact amount of water listed but you will want to adequately cover the bones or carcass. If I list a specific amount your bones/carcass could be larger and it wouldn't be enough, so make sure to completely cover. 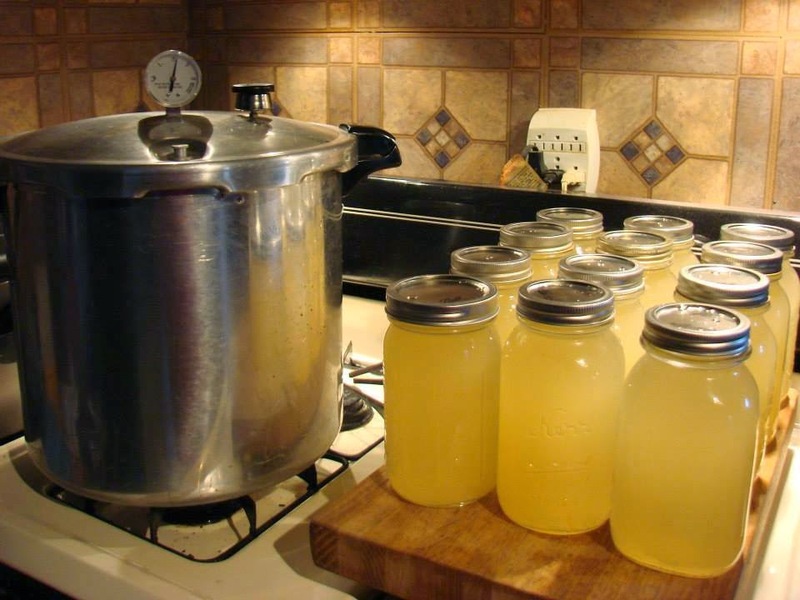 First let's talk about canning meat or chicken stock. Beef: Saw or crack fresh trimmed beef bones to enhance extraction of flavor. Rinse bones and place in a large stockpot or kettle, cover bones with water, add pot cover, and simmer 3 to 4 hours. Remove bones, cool broth, and pick off meat. Skim off fat, add meat removed from bones to broth, and reheat to boiling. Fill jars, leaving 1-inch headspace. Chicken or turkey: Place large carcass bones with most of meat removed in a large stockpot, add enough water to cover bones, cover pot, and simmer 30 to 45 minutes or until remaining attached meat can be easily stripped from bones. Remove bones and pieces, cool broth, strip meat, discard excess fat, and return meat trimmings to broth. Reheat to boiling and fill jars, leaving 1-inch headspace. Remove excess fat. Cut the chicken into suitable sizes for canning. Hot pack. Boil, steam, or bake meat until about two-thirds done. Add 1 teaspoon salt per quart if desired for taste. Fill jars with pieces and hot broth, leaving 1¼ inch headspace. Raw pack. Add 1 teaspoon salt per quart if desired for taste. 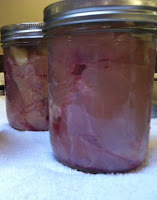 Fill jars loosely with raw meat pieces, leaving 1¼ inch headspace. Do not add liquid. Wipe jar rims with a dampened, clean paper towel. Adjust lids and process. Choose fresh chilled meat. With venison, add 1 part high quality pork fat to 3 or 4 parts venison before grinding. Use freshly made sausage seasoned with salt and cayenne pepper (sage may cause a bitter off-flavor). Shape chopped meat into patties or balls or cut cased sausage into 3–4-inch links. Cook until lightly browned. Ground meat may be sautéed without shaping. Remove excess fat. Fill jars with pieces. Add boiling meat broth, tomato juice, or water, leaving 1 inch headspace. Add 1 teaspoon of salt per quart to the jars if desired for taste. Wipe jar rims with a dampened, clean paper towel. Adjust lids and process. Elizabeth's Ground beef and sausage! Choose quality chilled meat. Remove excess fat. Soak strong flavored wild meats for 1 hour in brine water containing 1 tablespoon of salt per quart. Rinse. Remove large bones. Hot pack. Precook meat until rare by roasting, stewing, or browning in a small amount of fat. Add 1 teaspoon of salt per quart to the jar if desired for taste. Fill jars with pieces and add boiling broth, meat drippings, water, or tomato juice (especially with wild game), leaving 1 inch headspace. Raw pack. Add 1 teaspoon of salt per quart to the jar if desired for taste. 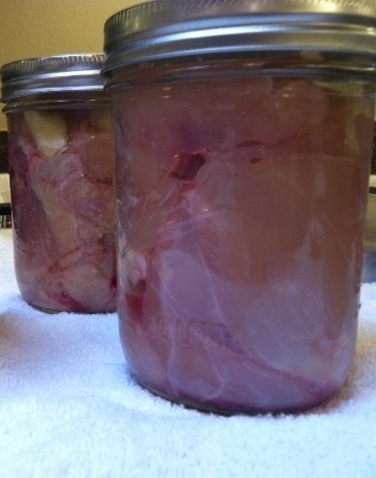 Fill jars with raw meat pieces, leaving 1 inch headspace. Do not add liquid. Wipe jar rims with a dampened, clean paper towel. Adjust lids and process. • Follow directions exactly for filling jars. Over-packed jars do not heat as evenly as correctly packed jars. • Always can meats in a pressure canner. Boiling water canners or steamers do not produce temperatures high enough to kill botulism-causing bacteria and other spoilage organisms. • Never can in an oven (electric, gas, wood-burning, or microwave). • Be sure the pressure canner dial gauge is accurate. 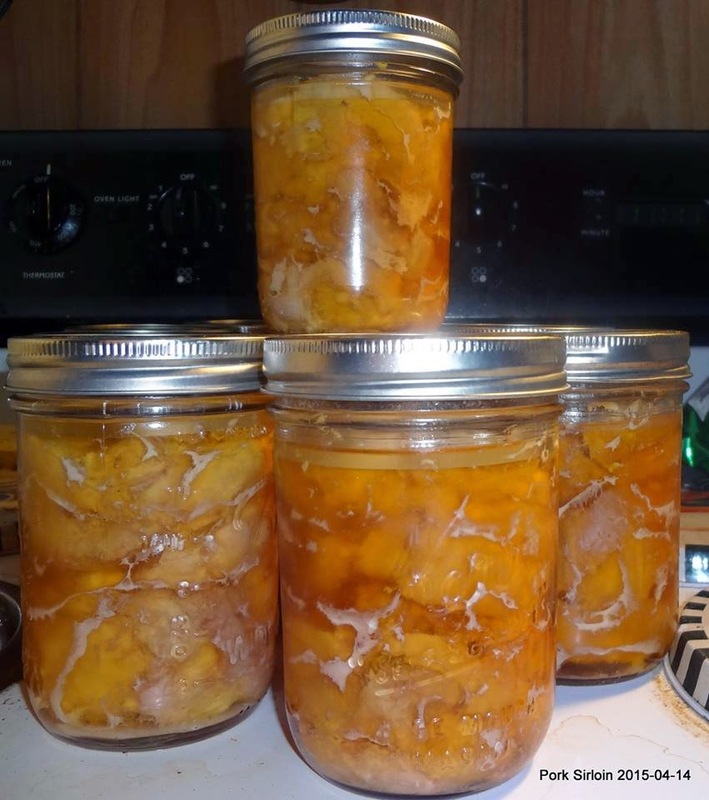 Test it once a year or more often if you do a great deal of canning or drop the lid. • Always exhaust (remove) air from a pressure canner for 10 minutes before letting pressure build. 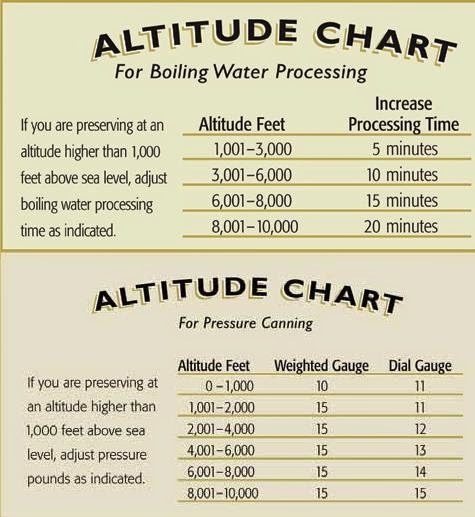 • Increase pressure at altitudes above 1,000 feet for weighted gauge canners or 2,000 feet for dial-gauge canners to reach the proper temperature (240°F) for pressure canning. • Never can meat products for which you do not have researched processing times. 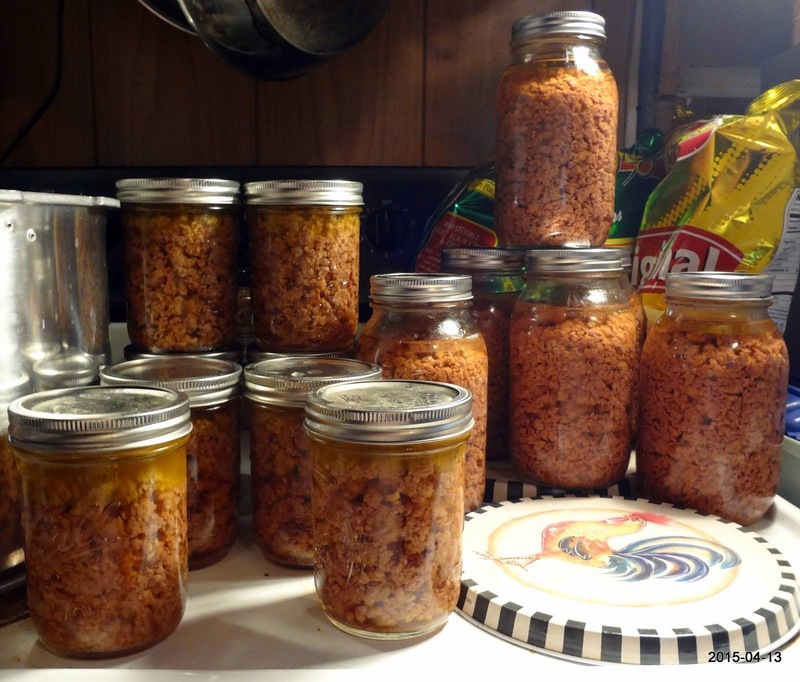 A safe canning time cannot accurately be determined at home. additional 1,000 feet of elevation. Why is it necessary to remove as much fat from meat as possible before canning? Fat left on meat will climb up the sides of a jar during processing and may prevent sealing. Is it safe to can meat that has been frozen? Yes, but it must be thawed first. Thaw meat in a refrigerator until no ice crystals remain. Plan to process within two days. Is it safe to can other animal products such as butter and cheese? No government agency has tested these methods for safety. There is a concern that any procedures provided by private sources are not sufficient to destroy the bacteria that can cause botulism poisoning.